The inspiration for this pattern came from a magazine. I saw a saree, which was embroidered on the border and pallu. It was done in aariwork[hook]. I still haven’t tried doing that work. My idea was to work chain stitch in single strand of cotton skein. Then I bought a semi-tussar saree, in maroon, green ,black, beige colours[all colours together in one saree]. For this ,a semi tussar blouse material in maroon was chosen. With all my enthusiasm[this was in place of my skill] drew the pattern on graph paper. 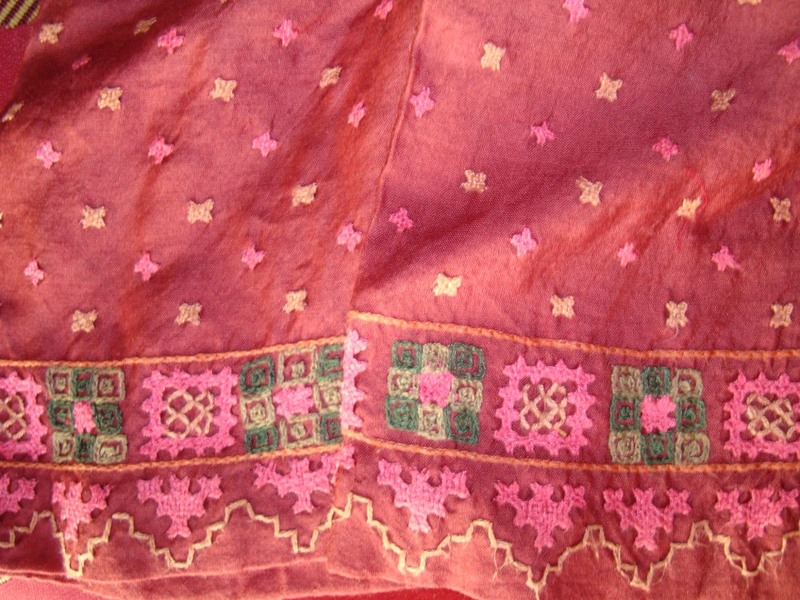 A medium size border, with uniformly placed single squares[for kutchwork] all over the sleeves of the blouse. These single squares were done in two colours[they were slightly apart, which meant I couldn’t cross over from the wrong side] all together a time consuming foolish pattern idea! The border was a piece of cake compared to the single squares. I seem to have used the kutchwork with a vengeance on this blouse. As for the colour combination, the threads I used were based on the saree colours, but they do look dull. Lesson learnt- when doing a time consuming large embroidery, make sure the colours look extraordinary and matches most of the common outfits. Only then it is attractive. Now the saree has gone, It is so difficult to use this blouse now.